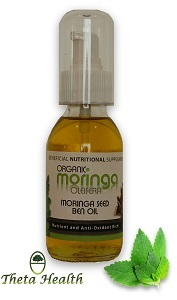 Moringa Seed Ben Oil is the oil squeezed from the moringa seed and is a very nutritious and powerful oil. Our moringa oil is a very potent natural oil with many health benefits. For use on skin: apply moringa oil and lightly massage on the skin. Leave it on for several minutes for the skin to be well nourished. For use on hair: Moringa oil is useful in lifting dirt out of the hair and is an efficient natural cleanser. By simply wetting the hair, massaging the oil into the scalp and rinsing can effectively clean and moisturize the scalp. Suitable for vegans, diabetics, and lactation. Do not use during pregnancy (only before and afterwards). What Are The Benefits of Moringa Oil? It's useful to know that Moringa oil is well known for it's natural protective properties and has been used for many centuries. Moringa oil was used by the Romans and Egyptians, particularly for skin protection from the sun. Moringa oil is extracted from the seeds of the long pods produced by the moringa tree and is highly nutritious. The oil is pressed from the seeds and can be used internally or externally. Moringa oil has many uses and not just for it's health benefits. The oil is also used in perfumes, beauty products such as make-up, soaps and hair care because of it's skin cleansing, moisturising and anti-aging properties. Moringa seed oil is also used in cooking, salad dressing, and for lubrication of mechanical parts. Moringa oil is so special as it has very high concentrations of vitamins, minerals and other nutrients other oils don't have. Because of this high concentration, Moringa oil is a highly beneficial oil when it comes to using it for health purposes. The properties in the oil of the Moringa seed are widely used for a more healthy and better looking skin because it absorbs easily and quickly. Used as a moisturiser the oil is perfect for softening and maintaining moisture within the skin, and beneficial for skin problems such as dry flaky skin, psoriasis, eczema, and dermatitis. The anti-aging properties in Moringa oil also benefits skin damage, sagging and wrinkling, which is why it is used in some beauty products. Moringa oil can also be used to enhance the health and strength of the hair and scalp. As an anti-inflammatory, Moringa oil reduces inflammation by applying it directly to the body or used internally by ingestion. The therapeutic value of this oil is due to the nutritional properties it contains. The anti-inflammatory properties of Moringa oil are perfect for tackling acne problems, pimples, blackheads and even the scars left behind. The seed oil can be used on cuts, bruises, rashes, insect bites and sun burn. Using it as a natural disinfectant will aid in treating wounds. Why Use Our Moringa Oil? Our Moringa oil is in pure form, providing the full health benefits of what Moringa seed oil properties naturally give. It has been made from the moringa seed, grown and harvested in non-polluted areas, allowing for a high quality yield.